Hello there, Latisha with you today. October is Breast Cancer Awareness month here in the United States. It is estimated that 1 out of 8 women, will be affected by this horrible disease. In honoring awareness. 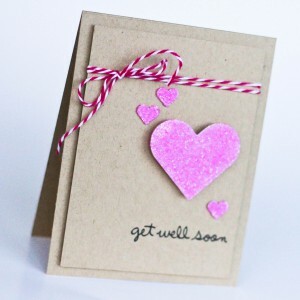 I created a simple Get Well Soon card with a pink heart. I scored kraft cardstock, and layered it with another kraft panel. I added glitter to the Scrapbook Adhesives by 3L 3D Foam Hearts. This is a great technique when working with glitter, fast and simple, we call it Wear Your Adhesive on the Outside. 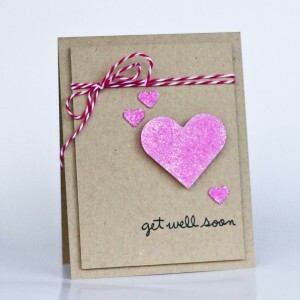 Sometimes a simple card, with a great sentiment is the easiest route when I want to sent a get well soon card. This entry was posted in 3D Foam Shapes, 3D Foam Squares, Adhesives, Cards, Crafts & Tutorials, Embellishments, Permanent Adhesive, Seasonal Craft Ideas, Wear your Adhesive on the Outside and tagged 3D Foam Hearts, 3D Foam Squares Regular White, Card, Get Well, Glitter, Latisha Yoast, Lawn Fawn, Stamping, The Twinery, Wear Your Adhesive on the Outside, Wow Embossing Powder. Bookmark the permalink. 2 Responses to "Get Well Soon Card"
Our mother passed away when I was 13 . I am 54 yes old and it’s like yesterday to me.she left 10 children behind because of this disease. I love this card and will make some for friends going through treatment now. What a sweet card love the heart thank you for being a part of this awareness campaign it is important to woman all over the world!